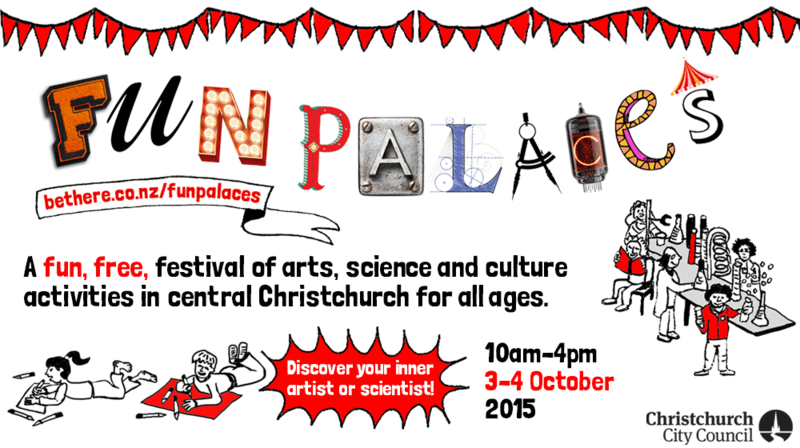 Free, pop-up Fun Palaces for everyone – arts, science and culture activities in the central city on Saturday 3 and Sunday 4 October. You could win a bicycle worth up to $2,000! Central Library Peterborough is our Fun Palaces HQ. Beca Heritage Week’s theme is "Arrivals and departures – the journeys that have shaped us”. Library events include storytime on the double decker bus, a family history session, and cemetery tours. Take part in our annual Photo Hunt. 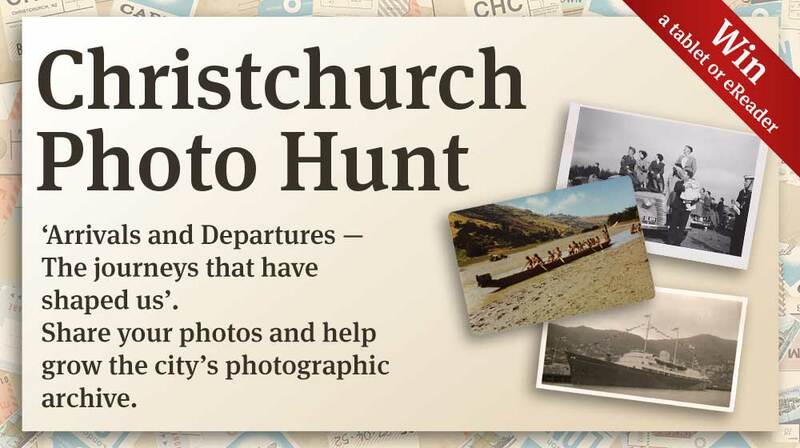 Share your photos and help grow the city’s photographic archive. You could win a tablet or eReader. The Halswell Library building is closing Saturday 3 October at 1pm. Preparations continue for the opening of the library at Te Hāpua: Halswell Centre in late November. Fill out this survey on your expectations of the new facility. Papanui Library is reopening on Monday 12 October. Lyttelton Library will be closed from February to November 2016 for repairs. Lyttelton/Mt Herbert Community Board and Libraries staff invite you to an ideas and discussion meeting on 21 October. Join in the Big Library Read. Unlimited access to borrow eBooks The Door in the Hedge by Robin McKinley and In the Shadow of Blackbirds by Cat Winters between October 7 to 21. Children’s non-fiction, fiction, picture and board books, and young adult titles for sale. 1 and 2 October at Fendalton Library. A national touring exhibition by GNS Science and New Zealand Oil & Gas. 14 November to 6 December at Fendalton Library. Our team of staff pickles are here to bring you recommendations with flavour. We are sharing booklists, book reviews, and blog posts - all about the books, movies, TV, and music we love. School holidays are on until 11 October. Browse our list of things to do in the holidays. Libraries will close for Labour Day (Monday 26 October) and Show Weekend (Friday 13 November). one of ten $100 prizes of tickets.